For those of you who are using gas or electric fireplaces the most common thing that you need to have the framing of the fireplace. The frame of any fireplace depends on the architectural designs of the room where it resides plus also the building condition and structure. Some of the common fireplace framing style popular among us includes Colonial, arts and crafts, Victorian and Art Deco styles. You will notice that any colonial fireplace mantels are designed with straight lines accented together with cornices or even carved accents. As for Arts and crafts or Mission-style fireplace frame is a design that incorporates tiles or stones centered around on simple, straight and fitted pieces of wood. The framing of Victorian fireplace comes with an ornate which is carved using marble, plaster or wood. In addition, it usually uses the shape like flowers, leaves as well as ribbon. The framing for Art Deco fireplace is designed with straight and minimalist lines together with stacked geometrical shapes of a fans and arches. Below is some information to help you understand the basic in order for you to make framing for your fireplace. First thing that you need to do is to come out with a layout for your fireplace and plan your first task that you should be doing plus also determining the height of your fireplace frame from the floor that you like. All of the above factors are important in order to have the finish materials that need to use in the surrounding section of your fireplace unit. Solid wood is the most used material for framing fireplaces because it can be shaped, carve and bent according to your desired design for the front of your fireplace. In addition, solid wood will provide you with a warm look, rustic outcome plus also providing you with rich and formal feeling of ambience. Besides that, wood would be able to complement very well with other materials like rock, stone and glass in order to create wonderful designs. The framing of your fireplace is normally created like a standard window but instead it is build inside a wall. Located above the rough opening of your fireplace, there should be a header that enables you to transfer load from above around the opening. The starting point for the height of your fireplace rough opening will depends solely on the way you want to finish it. For instance, for a 12-inch tile that goes around the rough opening or the face of your fireplace unit must be at least 12-inch or 24-inch or 36-inch above the floor so that your finish work can be done in a quick manner. Build the fireplace floor along with its ceiling inside the walls where your fireplace is located. For the flooring, you have to frame out two 2-by-4 knee walls along with 3/4-inch OSB that covers the entire floor where your fireplace resides. The same goes for the ceiling where you need to frame it with 2-by-4s before sheeting it with 3/4-inch. Another option that you can use is to install at least 6 inches of nonflammable material. The items include firebrick, stone or marble tile that surround the opening of the firebox. You would be able to create Hand-carving pieces to frame a fireplace. By choosing hand carving, you should be able to create Ornate or simple curves designed to handle relief, rustic timbers and planks. You only need a few materials and tools. 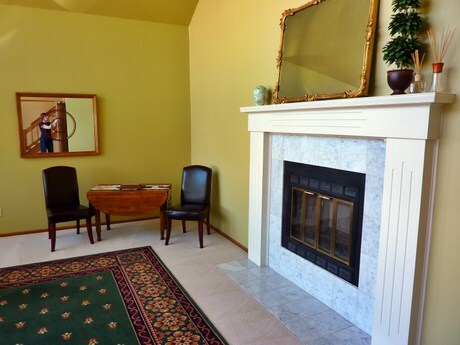 Your fireplace framing can also be customize so that it would be able to display mementos that you get from vacationing to other countries such as decorative rocks or carved end pieces. You can even purchase fabricated moldings, carve thick pieces of natural wood as well as having the ability to assemble a fireplace like the mantel kit. If you want to create a simple and attractive hand-carved designs that can be done based on your knowledge.